LetsRun.com is the Internet’s home for runners. Runners – those people for whom running is not something they do from time to time – it’s part of who they are. LetsRun.com is the home of Olympic track and field fans. On LetsRun.com, the Olympics aren’t an activity that rolls around every four years. They are the pinnacle that athletes reach after a lifetime of hard work and dedication. LetsRun.com is real and authentic. We’re not going to hold your hand on LetsRun.com, but we’re not going to talk down to you or tell you every shoe is the greatest shoe ever. If you email us, you’ll hear back from us, as we’re real people. As a result of all of this, most importantly, LetsRun.com is a community of the most amazing group of people united by their love of running. From Olympians to the guy with MS who can’t run anymore, but can still coach, LetsRun.com is the greatest and most influential runners on the planet, well the English speaking portion of the planet. We don’t try and re-invent the wheel at LetsRun.com. We cover the sport of running in a simple, effective way 365 days a year. There’s a reason journalists throughout the world come to LetsRun.com to find out what is going on in the running world. If the best story is in the New York Times, we send you there. The big events, the Olympics, the World Championships, Boston, New York, London, etc we’re there and we cover them like no one else. Along the way we try and inspire you. One of the greatest things about running is that you can’t succeed at it without a lot of hard work. Thus, there are a ton of inspirational stories in the sport. After our homepage, the most well visited part of LetsRun.com is our world famous message boards. It’s where you our amazing visitors share all your incredible knowledge about the running (and non-running world). The message boards are an integral part of LetsRun.com and we often highlight the content on them. The boards are THE place that runners from all over the world go for the latest news, results, and gossip in the running world. While we moderate the forums, one unique feature that encourages the free flow of information is if you want to be anonymous on our forums you can be. LetsRun.com is first and foremost a community of runners. The message boards are where all those conversations you have on your runs continue when you get back from the run. LetsRun.com was founded in the spring of 2000 by twin brothers Weldon (“Wejo”) and Robert Johnson (“Rojo”). Weldon had qualified for the 2000 Olympic Marathon Trials and decided to quit his job as an economic consultant to move to the mountains of Flagstaff, Arizona to pursue his long shot dream of the Olympics. Robert decided to move to Flagstaff to help Weldon with the arduous training weeks of up to 140 miles. Truth be told, the Brothers Johnson (aka “Brojos”) had a lot of free time on their hands as fortunately most human beings don’t run more than 3 hours a day. This little thing called the internet was fairly new and there was one problem, there wasn’t a website for people who lived and breathed running. The LetsRun.com singlet (right) pacing Paula Radcliffe to her first marathon world record. 2) Help more people get more out of their running (by spreading the coaching genius of John Kellogg). Fortuitously for LetsRun.com, after LetsRun.com launched, Weldon’s running career went on a fairy tale projectory. His 10,000m time dropped by 1 minute and 20 seconds in one race, and soon he had gone from being top 100 in the country to top 4, all the while wearing a simple yellow singlet with the letters “L E T S R U N . C O M” on them. LetsRun.com picked up a cult-like following in the elite running ranks and kept expanding its base. Soon what had started as a hobby for the Brothers Johnson had turned into a business and now in 2013 “little” LetsRun.com is averaging more than a million unique visitors a month. Now, not all of the Brothers Johnson’s dreams become reality. Three guys in the country usually make the Olympics, Weldon got fourth in the country twice (and hurt in 2004). Robert just missed making the Olympic Trials. These “setbacks” did not diminish the Brojos love of running, they only enhanced it. 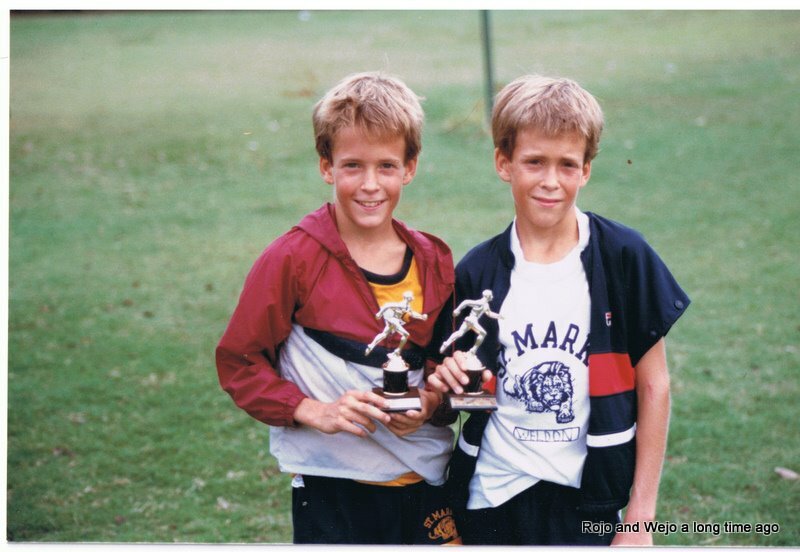 From starting off as little munchkins in middle school cross-country (photo right), the Brojos had learned so much about life through running. We hope you learn a lot about running and a little bit about life on LetsRun.com. We definitely want you to enjoy the sport of running more. PS . If you need to contact us click here. PPS. To read an article that describes LetsRun.com’s founding and its growth way better than we could possibly do so ourselves, please see the Marathon & Beyond feature on LRC by clicking here. To learn more about the magazine, Marathon & Beyond, go to their website.